View north on West Street towards Kent Street. Recently, the Department of Buildings issued a demolition permit for a portion of the historic Eberhard Faber pencil factory site. 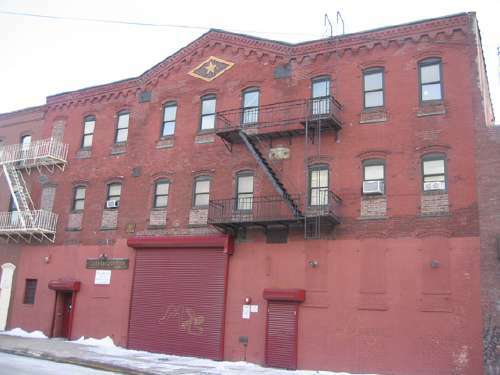 The permit covers a site that includes three buildings, all of which were once part of the pencil factory complex. It is not clear from the permit if the demolition is for all three buildings, or only one. In the past week or two, scaffolding has gone up around the building at the corner of Kent Street and West Street (the three story pink building at the left center of the photo above, and at the far left in the photo below). While this building is not the most distinctive or historic in the Faber complex, it shares a lot with an older two-story structure that is very characteristic of the Eberhard Faber buildings. 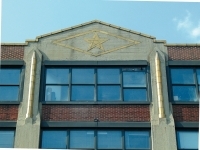 That building (seen at the far left in the photo above) has the characteristic pedimented cornice with a yellow terra-cotta star at the center of the parapet, a motif that is also seen at 59 Kent Street in the photo below). 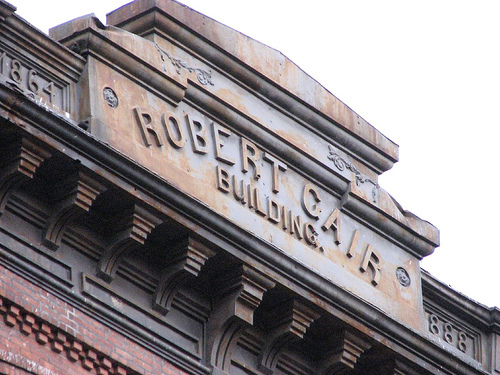 Curbed did a little sleuthing to find out what is in store for the site. Based on the rendering they found, the 2-story Faber building on West Street is history too. WPA showed this site to Landmarks almost a year ago, but so far no action. Scaffolding up at Eberhard Faber. An update on our earlier post - here is fresh photographic evidence of the scaffolded West Street Buildings. This view is looking north towards the corner of Kent Street and West Street. Some more information on the Eberhard Faber demolition site. 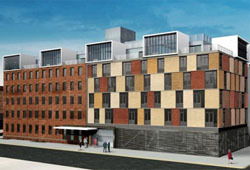 Justinyc notes that the developer of the Kent and West Street site is none other than Isaac Katan. 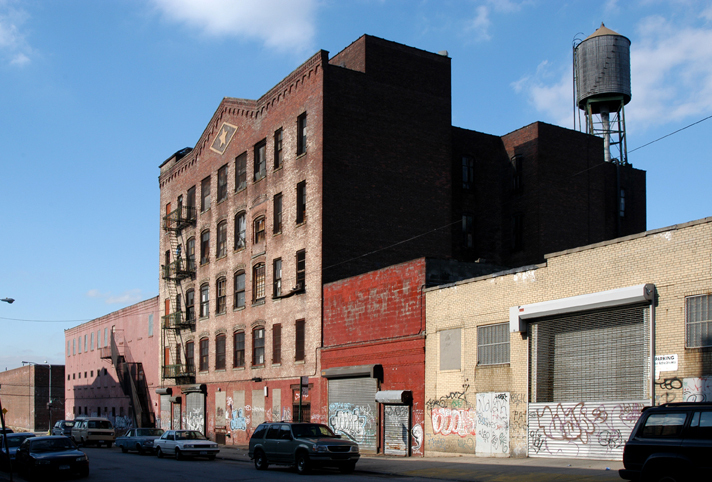 Katan, who has a rep in South Brooklyn [warning: very slow link], also wants to demolish the Domino Sugar factory. In the case of these Eberhard buildings, he already has the demo permits, and the scaffolding is up. Meanwhile, no word from Landmarks on the designation of an Eberhard Faber historic district. 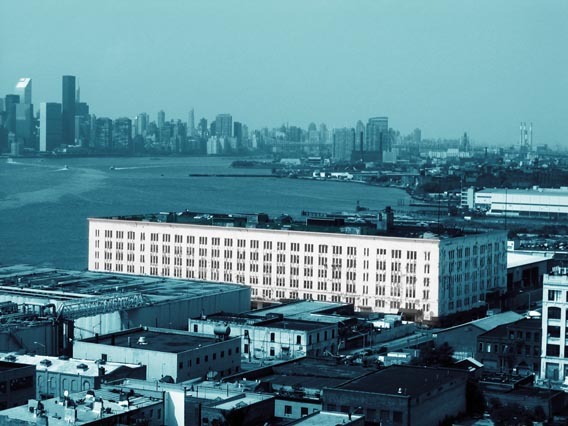 Landmarks has just announced that the Eberhard Faber Pencil Factory complex is on their calendar for a designation hearing next Tuesday, 17 April. Time, TBA. More info to follow (breaking, as they say). UPDATE: As noted below, Landmarks has announced that they will hold a hearing next Tuesday to calendar the Eberhard Faber Historic District (see map, below). 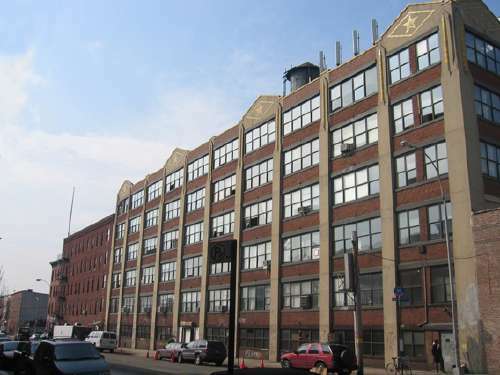 The historic district includes the iconic pencil building at 61 Greenpoint Ave. (above), and the original pencil factory building at 37 Greenpoint Ave. (below). 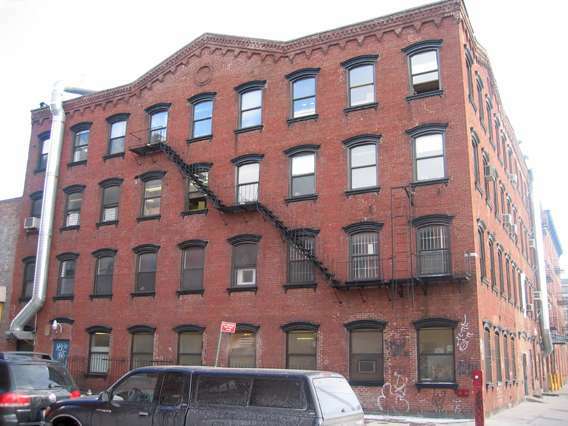 Also included are the buildings at 58 and 59 Kent Street, and the building at 104 West Street. The designation does not include the buildings on West Street between Kent and Java (X marks the spot on our map). Developer Isaac Katan demolished two of these buildings within the last month, and has plans to significantly alter the remaining building at the corner of Java and West. We will post more details on the hearing as they become available. A quick update on the Eberhard Faber Historic District. 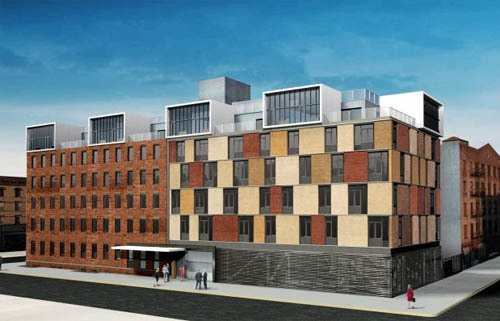 At this morning's Landmarks Commission hearing, the Commissioners voted unanimously to put the complex on the calendar for designation consideration. The research staff made a brief presentation, after which there were a few questions from the Commissioners and the vote. The district is not landmarked - yet. What this means is that sometime in the next month or two LPC will hold a formal hearing to decide whether or not the EFHD should be officially designated a NYC Landmark. In the meantime, the fact that the district is officially on LPC's calendar does mean that no alterations (or demolitions) can be undertaken without the approval of LPC. So no more funny business for the time being. And, of course, you can testify at the Landmarks hearing, when the time comes. We will keep you posted. The Pencil Building (ca. 1930) - part of the proposed Eberhard Faber Historic District. The Landmarks hearing for the designation of the Eberhard Faber Historic District will be Tuesday, 24 July 2007, starting at 9:45 AM. The hearing will be held at the Landmarks Commission's hearing room at the Municipal Building, 1 Centre Street, 9th Floor North (ID required for building entry). The J, M and Z Chambers Street station and 4, 5 and 6 Brooklyn Bridge Station are both under the Municipal Building; the R and W City Hall station is about a block away (sorry, no G train access). For more on what is and isn't part of the proposed Eberhard Faber Historic District, please see our earlier posts on the subject. In yesterday's City Room, David Dunlap has an update on the Eberhard Faber designation. The hearing for the Eberhard Faber designation is this morning, at about 10:00, at the Landmarks Preservation Commission (1 Centre Street, 9th Floor North). Also on the agenda for today is the actual designation of the McCarren Park Pool (almost 15 years after the first designation hearing (! ), and close to a quarter century after the pool closed). In other Brooklyn news, LPC has the calendaring of the DUMBO historic district on its calendar for this morning. Another very long-overdue designation. You may remember that the proposed Eberhard Faber Historic District leaves out a few parcels. 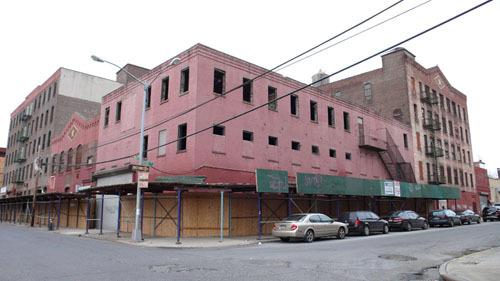 Part of a development project by Isaac Katan, two of the three parcels on West Street between Kent and Java have been demolished (shown in the foreground, above, pre-demolition), while the third (in the left background, above)has been altered, but not dramatically. It may be sloppy reporting, but this article on funding for the project would lead one to believe that LPC is designating the Katan site along with the rest of Eberhard Faber. Certainly they should - even with the proposed alterations, the Katan properties are part of Eberhard Faber's history. Next week, the Landmarks Commission will be holding a marathon public hearing/public meeting that will focus exclusively on designation of new landmarks and historic districts. 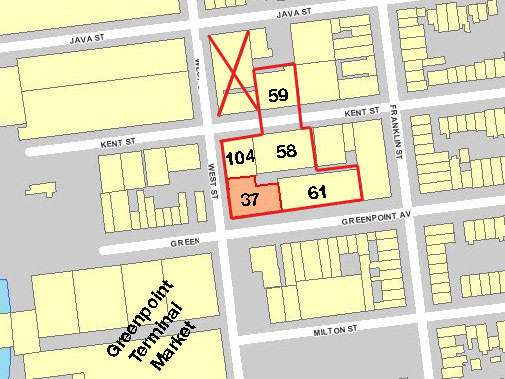 By far the largest item of the day will be the long-overdue initial hearing for the proposed DUMBO historic district. There is, of course, another small district that is scheduled to be designated. But all of that is a week away. 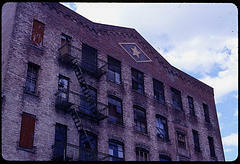 In the meantime, here is architectural historian Francis Morrone on DUMBO. As we mentioned before, LPC is holding a mega-designation hearing on Tuesday the 30th. 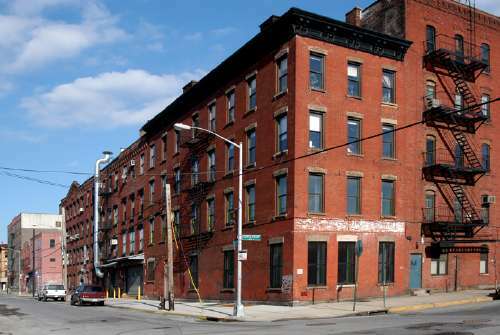 In addition to the initial Dumbo hearing, Landmarks is expected to designate the Eberhard Faber Historic District. The Eberhard Faber district encompasses most (though not all) of the buildings of the former Eberhard Faber Pencil Factory. An intersting mystery at Greenpoint Reformed Church on Milton Street. The tiles in question were manufactured by Union Porcelain Works, whose president, Thomas Smith, owned the company. 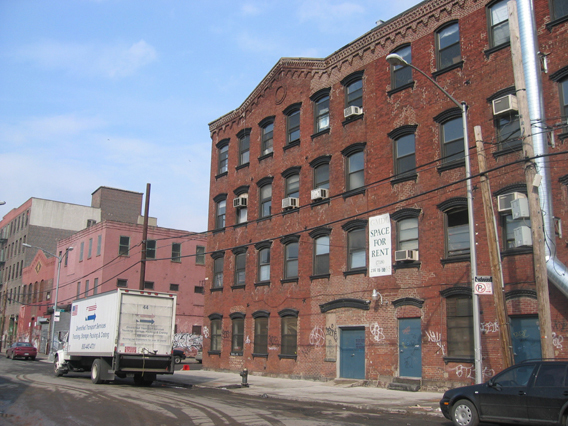 Union Porcelain was located on Eckford Street, just east of where McCarren Park Pool is now. 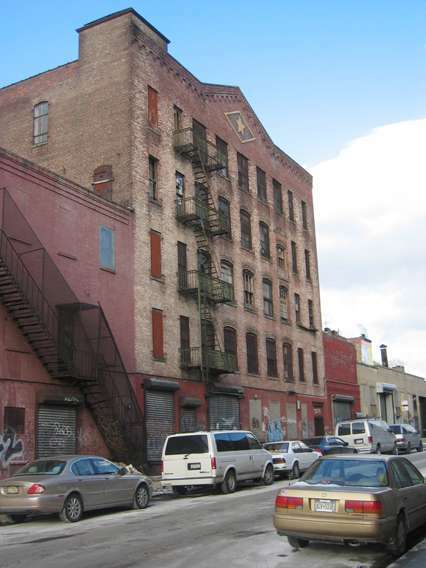 In the 19th century, Greenpoint was a center of porcelain manufacture - one of the oldest such establishments was Faience Pottery Works, located at the corner of West Street and Greenpoint Avenue (and now part of the Eberhard Faber Historic District). 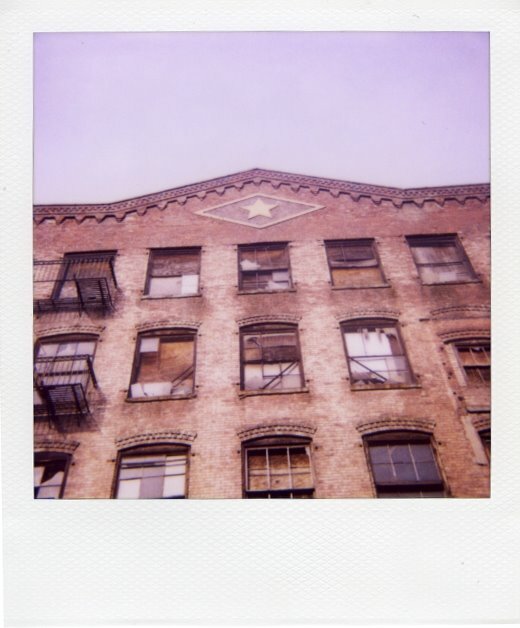 Williamsburg photographer Porter Hovey has been busy with her Polaroid camera, and has a blog dedicated to the project. In addition to this shot of one of the Eberhard Faber buildings (we're pretty sure its 59 Kent Street), there are a lot of other nice shots of Greenpoint & Williamsburg. 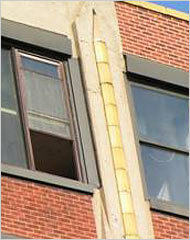 Well worth a few minutes of exploration (definitely check out the Harte Building photo).